When you want everything new to be old again, head for the paint store, not the flea market. Crackle glaze mixes colors and chemistry into beautiful distress. Shiny new decor may depend for character and a certain gravitas on the appearance of age and wear. A faux finishing sleight-of-hand that fools the eye is crackle glazing -- creating the crazed, cracked look of old, deteriorating paint that's about to chip and flake off. You can do it with a simple, swipe-on liquid that reacts with wet paint to produce a crazed finish. Pick your colors with care -- it takes more than one paint color to achieve the effect -- _follow the directions_ with even more care, and try not to be smug about all the compliments. Whether the surface is wall, trim or furniture, you'll need an undercoat that peeps through the topcoat cracks when the craqueleur job is done. For best results, **choose contrasting colors**. A dresser painted with a base coat of lilac, crackle glazed with a topcoat of plum, becomes a plum dresser with a crazed pattern of palest purple showing through the cracks. Whitewashing over a darker color is a popular way to handle crackle glaze. The chalky white topcoat over a traditional shade like forest green or gunmetal gray gives an impression of an old, much-painted artifact from another era. Just use flat or barely glossy paint for the topcoat so the cracks break cleanly and the effect works. Time and weather are tough on exposed **windowsills, chairs and tables, hutches and porch walls**. When your new finishes need mellowing to blend with your vintage sensibility, crackle glaze them, entirely or in random sections, to mimic natural aging. This is your basic two-color craqueleur -- fake but fabulous weekend work. Milk paint is a fun way to go for rustic and primitive decor. The paint is opaque and goes on smoothly with good coverage. The colors are traditional, which contributes even more to an authentic time-worn look. Pick strongly contrasting base and topcoats -- Confederate gray under buttercream, or baby blue under bard red -- and let the base coat dry overnight. Apply the crackle glaze according to directions; let it dry to tacky and then lay on an even topcoat, being careful not to go over any freshly painted areas and disturb the chemical reaction. The crazing will make large, regular, prominent cracks or veins in the topcoat, letting the base coat show through. Cover a cured piece with clear varnish or polyurethane for protection. 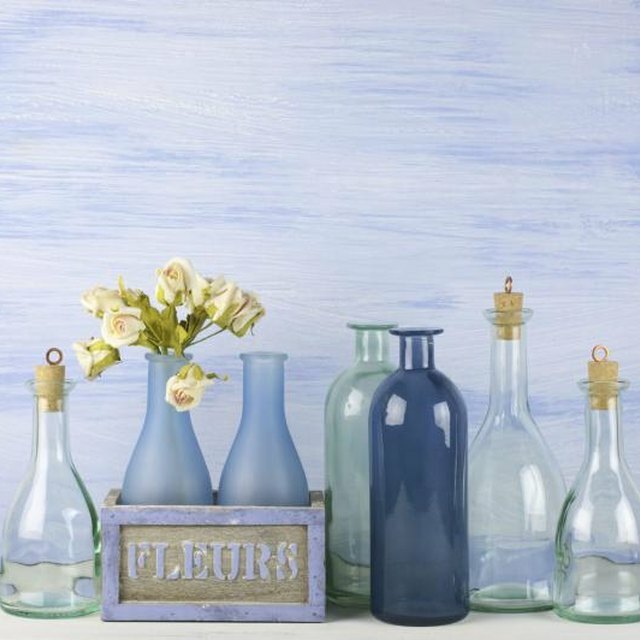 Show off your faux finishing skills by refining a crackle glaze finish to look like antique china. Old porcelain develops a crazed finish under the clear top glaze that you can recreate for **picture frames, decorative accessories or tabletops** with a twist of basic crackling technique. Brush on the base coat, let it dry and apply the crackle glaze. When the glaze is tacky, sponge on the top color. To avoid disturbing the crackle medium and ruining your finish, load the sponge with a thin layer of paint and press it to the crackle-glazed surface -- firmly but just once. Sponging encourages a web of finer, smaller cracks in the dried finish. An interesting craqueleur effect looks like [old stressed metal](http://wwwsherwin-williamscom/wcm/idc/groups/public/@swpublic/@sherwin-williams/@content/documents/webcontent/mdaw/mda0/~edisp/sw-pdf-cracklepdf) and can be used as a copper or battered tin finish on a chimney breast or kitchen wall or on furniture or porch planters. Apply a solid base coat of flat color -- two coats may be necessary for completely opaque coverage. Once the base color is dry, cover it with a coat of metallic color -- **copper, verdigris, steel or any metallic finish**. Let that coat cure overnight. The next day, roll on a very thin coat of crackle glaze, over the entire painted surface. When the crackle glaze is tacky, sponge on a clear, glossy, water-based polyurethane in sections, pouncing once to absorb any excess polyurethane and then moving on to the next area. The finished project looks like shiny, crazed "old" metal.